Squirrels belong to the most widespread and successful order in the world, rodents. Every species of rodents is a gnawing animal. Squirrels are no exception and have well-developed jaw muscles and front teeth shaped like chisels that can chew through just about anything. These front teeth are kept sharp by constantly gnawing on hard objects such as seeds and nuts and woody plant materials. When squirrels cause problems, the methods used to solve them must be specific to the problem at hand. Squirrels can cause a wide variety of problems. Therefore, there is no one squirrel-control method that is appropriate for every problem that might arise. The grey squirrel builds itself a nest, or drey, about the size of a football, made of twigs, often with the leaves still attached. It is typically built high up in a tree and lined with shredded bark, dry grass, feathers and moss. A summer drey is often quite weak and wedged neatly among branches. Occasionally a squirrel may make its nest in a hollowed out tree trunk or take over an old rook's nest after constructing a roof for it. A squirrel is capable of building several dreys. Generally speaking red squirrels are not considered pests but its cousin the grey squirrel definitely is. Grey Squirrels often inhabit attics, lofts ,roof spaces and outbuildings. Signs that they are present will include droppings and scratching noises. These can often be mistaken for rat droppings. Because of this, it is important that a qualified technician identifies which pest is responsible. 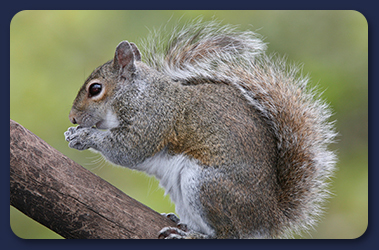 Grey squirrels are not thought to carry human diseases but can give a painful bite if they are startled suddenly. They can also pass on fleas to household pets such as cats and dogs. It is highly recommended that a professional squirrel catcher is used to trap the squirrel if one is discovered in your premises. Trim back any branches around or near the property. Cover up any entry points. Remove any firewood from around the premises. Repair and cracks or damages to the foundation of the building.